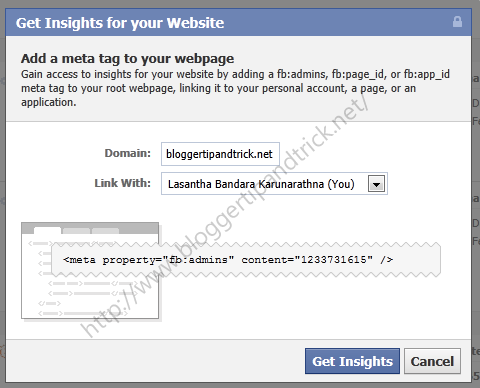 This post will explain how you can add Facebook Insights to your blogger blog. This steps not only for blogger but also other web sites. Facebook Insights provides Facebook Platform developers and Facebook Page owners with metrics around their content. By understanding and analyzing trends within user growth and demographics, consumption of content, and creation of content, Page owners and Platform developers are better equipped to improve their business and create better experiences on Facebook. Click on the button named "Insights for your Website". A lightbox window will appear. Enter your domain name and make sure you link it with "You". Look at the picture below. Login to your Blogger account and go to "Edit HTML" of your blog. Now add the meta tag you have copied just below the <head> tag. Now click on "Get Insights" button in light box window. you are done. Now when you visit the Facebook Insights page, you will see your website listed under Websites. Click on your site name, you will be able to access all sort of insights. I didn't test it. but will work with sub domains without problem. where should I visit facebook insight page, please tell me. I've already done like you say above. But I don't get any means..please help me.. I am already recieving them for my facebook fan page, but thanks for giving a tutorial for insights for blog. Will surely check it out . I have also heard that Facebook Insights is changing and becoming more better. I don't thinks this will help. Thanks for sharing. At last got it. great tuto, thanks a lot. nice post i get good information from that! Thanks for this, really useful and easy to set-up. Took me about 2 minutes! Thanks. Added for my page, Thanks mate!